Plant officials had testified under oath to two state panels that there were no buried pipes at Vermont Yankee that could leak tritium, although there were. No tritium has turned up in drinking water, but even plant supporters expressed dismay at the leak and the misstatements. I don't think this spells doom for that nuclear renaissance we keep hearing about. (Obama, recall, just announced $8.3 billion in loan guarantees for two brand-new reactors down in Georgia.) 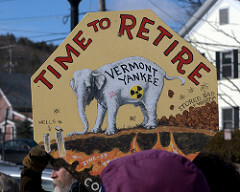 Essentially, the Vermont Senate voted to close the Yankee plant on schedule rather than grant it a 20-year extension—which, given that it was an older reactor and Entergy officials had provided misleading answers about the leaks under oath, seems more like a decision about this particular plant than a broader sign that nukes are unpalatable. One pressing question, though, is how Vermont will replace all that nuclear power going forward—the plant provides about three-quarters of the state's electrical generation. When the Yankee plant had to shut down temporarily in 2008 because of a leak in its cooling tower, the regional power system operator, ISO New England, had to flip on a bunch of fossil-fuel-fired "peaker" plants to keep the electricity flowing. And it'd be a huge step back, from a carbon-emissions perspective, if the state ended up building, say, a new coal-fired plant for its power.